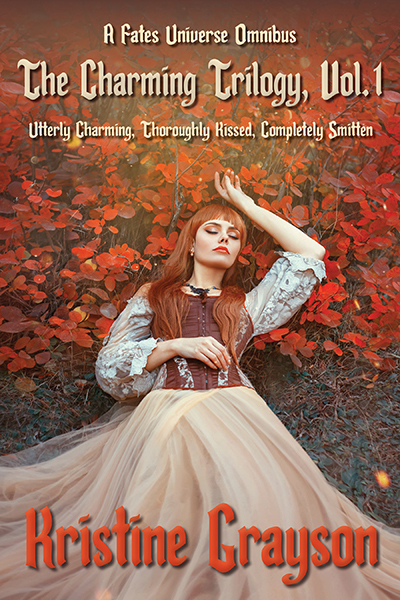 In this romantic trilogy, fairy tales and myths inhabit a slightly askew world of charming princes, sleeping beauties, and happily-ever-after endings. Filled with lively extras, including “The Strangeness of the Day,” the story that launched the whole universe of the Fates. Welcome to the fractious fairy tale world of Kristine Grayson, where the bumpy road to happily ever after surprises and delights. The omnibus contains three complete novels. When Prince Charming enters Nora Barr’s office to hire her to protect Sleeping Beauty, only the size of his check keeps her from throwing him out. Suddenly Nora finds herself protecting a VW Bug against an evil stepmother. Nora doubts happily-ever-after exists, but until last week she never saw magic before either. Let alone a real Prince Charming. Emma, the real Sleeping Beauty, awakens after a thousand years and swears to never kiss anyone again. Ever. She keeps that vow until she meets temptingly gorgeous Michael who—somehow—becomes the only person who can get her across country with her weird cat Darnell. Before her magic takes over their lives, and maybe destroys the entire world. For centuries, Darius shadowed Prince Charmings because he knew they needed happily ever afters. And he does too. After he fought Cupid, the Fates forced Darius to unite 100 soulmates. Two away from the end of his sentence, he falls for triathlete Ariel, seemingly destined for another soul mate only he can find. If he wants freedom, he must find her soul mate. No matter how badly it breaks his heart.